Our knockout roses in the backyard are looking amazing this season. Wish I could take credit, but it's all my hubby (not kidding). He's like the manliest man around, and this guy can grow some pretty roses. I mean, he's not reading rose cultivation books in his free time or harvesting his own hybrids, but he does a great job with keeping our plants fertilized and pruned. I love clipping some flowers from the insides and bottoms of the bushes so that they stay lovely outdoors but we can enjoy some colorful blossoms indoors. 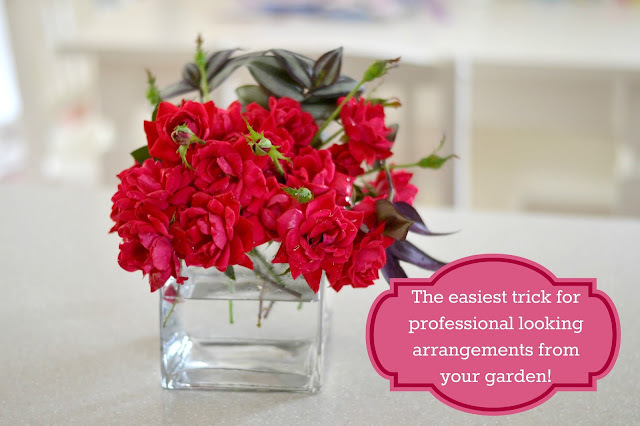 I have such an easy trick for creating a professional looking arrangement in your home. Gather your blooms along with a vase (here is the exact one I have) and some clear tape. You are going to use the clear tape to create a grid on the vase, like you can see in these photos. Reasons for the tape grid? 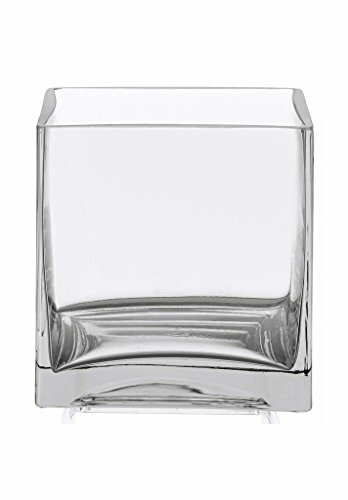 1) With a wide-mouthed vase like this, it keeps the stems standing upright and not flopping around. 2) It ensures that your arrangement will look stunning from ALL angles. And that's the key for a nicely done, quality arrangement. Start sticking the clippings into the grid. It may take a few times to see how you like the placement the best. I wanted a very organic, asymmetrical look for this arrangement. Make sure to take a few steps backward from time to time so that you can see how it looks from afar. And I mean ... THAT'S IT. I added in some Purple Wandering Jew clippings at the back to add a little contrast and some dimension. I really love the way it looks. Plus, I'm curious if it will root in the water, because Ian found some pieces that fell off in our yard and rooted! I think this arrangement looks so pretty on our entryway table, and considering that it was free to put together and completely easy, it's a major win in my book! I have the 5x5x5 size. 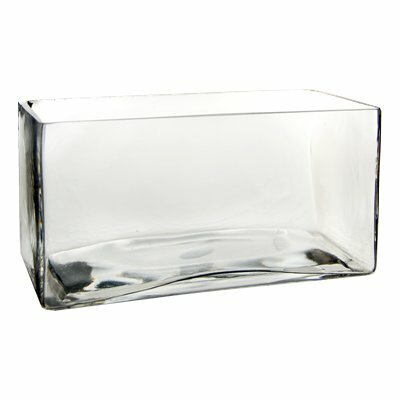 I am also crazy in love with this rectangular version. It's on Amazon HERE and also Prime eligible. 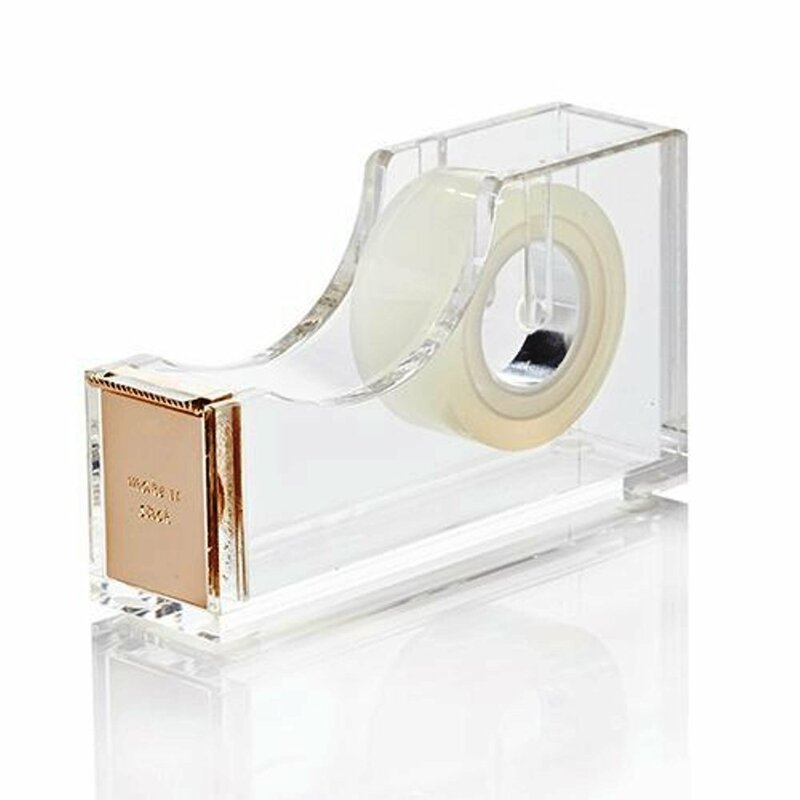 And if you really want to be a bad-a$$, then here's a Kate Spade tape dispenser for $24. Such a genius idea to use the scotch tape as a grid for the flower placement! Definitely using this method the next time I have some flowers to arrange!!! Lol about the tape dispenser! Thanks for the tutorial; it is a beautiful arrangement. We're lucky to have fabulous knock out roses too! Although we can take ZERO credit for ours, just the right sun/soil combo I guess. we've never fertilized them and Anthony "prunes" (aka whacks with weed eater) whenever he feels like they're too big hah I'm lazy and just do mini bud vases with them but maybe I'll get ambitious and do an arrangement here soon! Never thought of a grid... genius! I'm so glad you posted this. I never knew this trick! I definitely need to try that trick out...Bryce's mom who is a flower arranging whiz, uses it, too! Thank you for posting this! Fresh flowers are something I really want to add to the house, and this would make them look so magazine pretty!